This is a simple concept but one you may not have thought about in the past. Often times people think that each outfit needs to have a specific "look" whether that be rocker, feminine, casual, etc. By mixing different textures and styles you create an effortless ensemble channeling perfect balance and trend. To pull of this mix and match look simply pair a hard piece (leather, studs, metallics) with a soft piece (lace, sequins, florals). 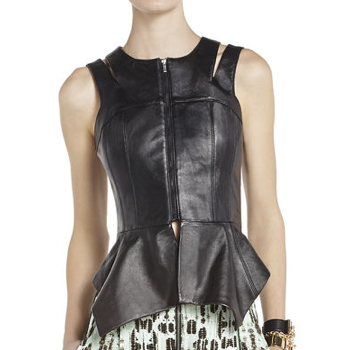 The below BCBG leather vest alone can come off quite harsh but when paired with the Anna Sui lace shorts it becomes a much more wearable outfit. The same goes for the studded skeleton tee. Who ever said lace and skeletons weren't a match? The Urban Outfitters lace collar swing tank is pretty and feminine standing alone but when paired with a sleek leather cigarette pant it becomes a much trendier with looking overdone. Mixing and matching different styles can be daunting at first but after instant success you will see there is nothing holding you back!